In the postmortem about Bush’s loss to Bill Clinton, called “An Incomplete President,” the Times in 1992 brought up his famous “read my lips, no new taxes” pledge. Bush famously reneged on the promise in 1990, in order to reduce the deficit as part of a budget agreement with congressional Democrats, and the Times hit him for not defending it better and then later apologizing to conservatives for it. 1992: Angry Republicans point fingers in every direction to account for President Bush’s defeat. Some blame an unfortunate turn in the business cycle from which no President could have escaped. Others blame bad advice from passive economic strategists, the nasty convention in Houston, his unaccountably late and lame campaign. All true, but the main reason for George Bush’s precipitous fall from political grace was George Bush himself. 2018: Fingers pointed in every direction after his defeat, a deteriorating economy, a divisive convention in Houston, a disjointed campaign. But one big reason for Mr. Bush’s precipitous fall was Mr. Bush himself, chiefly his inability to convince Americans that he understood the depth of their fears or could summon up a coherent plan for addressing them. 1992: Even after four years as President and a quarter-century in public life, Mr. Bush remains an oddly bifurcated, incomplete figure. He spent the better part of his life preparing for the White House — and fate dealt him probably the strongest hand in foreign affairs ever awarded a new President. For the most part, he played that hand cleverly and energetically. 2018: A Times editorial after his defeat called Mr. Bush “an incomplete president” — good at some things but clumsy at others. Fate had dealt him one of the strongest hands in foreign affairs ever awarded a new president, and for the most part he played that hand cleverly and energetically. The Washington Free Beacon reached out to the New York Times for comment and hasn’t heard back. 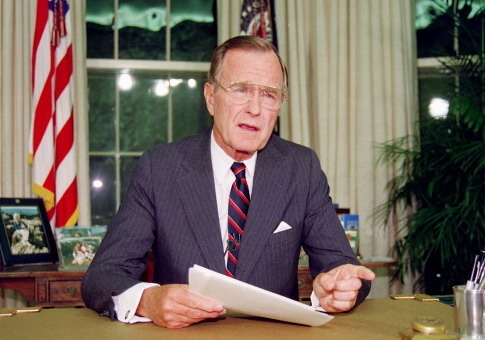 The post New York Times Editorial on Bush’s Death Borrows Heavily from One on 1992 Election Loss appeared first on Washington Free Beacon.